This event was held May 14 & 15, 2016. 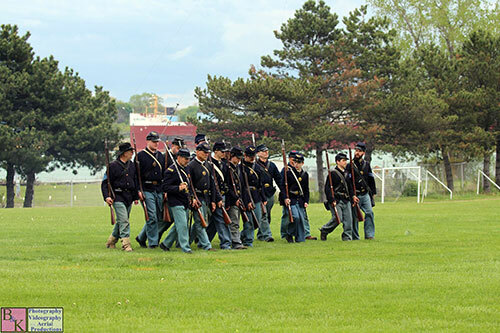 Civil War Days is the flagship event for the Coalition. 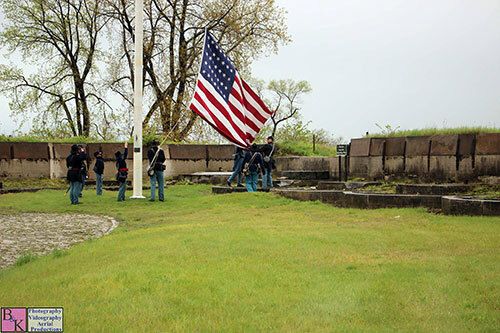 It's our best time of year to bring the Fort to life as it was during one of the eras the Fort served our country. 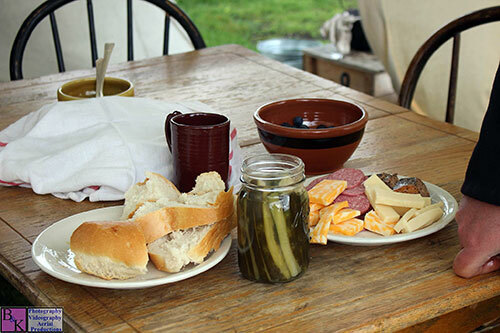 Many Union, Confederate and civilian living historians and behind-the-scenes HFWC volunteers dedicated their weekend, and braved the snow, to make the event a success. Additionally, they worked diligently to improve the look of the site through grounds care, site prep and historic restoration. All photos courtesy B&K Photography and Video. Civilians bring the Commanding Officer's House to life. 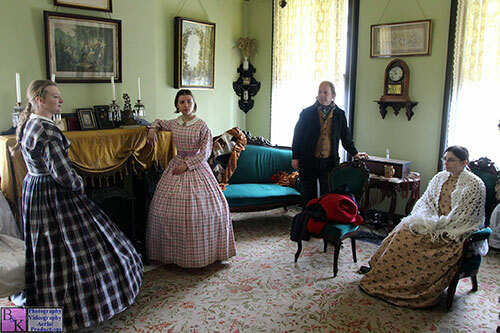 Here's why many of us volunteer, both in period dress and behind the scenes. 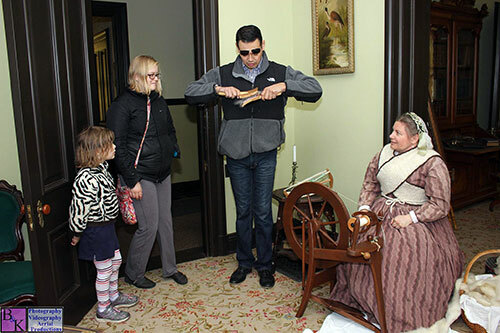 A guest experiences history by learning card wool, the step the prepares it to be spun into yarn and the spinning wheel. 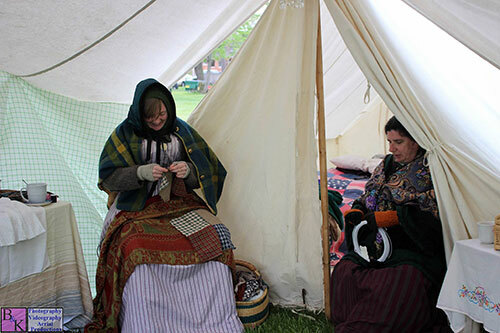 Civilian historians demonstrate handcrafts - despite a very chilly weather snap. This is dedication to history! Spread representative of food consumed by troops. This was an active United States post. As such, there are daily honor and duties to be performed. Here, men of the garrison lower the colors at the end of the day. Union Infanty is the backbone of the men who served here during the Civil War. Here, living historians demonstarte the military maneuvers. Union Commander Russ Paul watches the tactical demonstartion take shape. 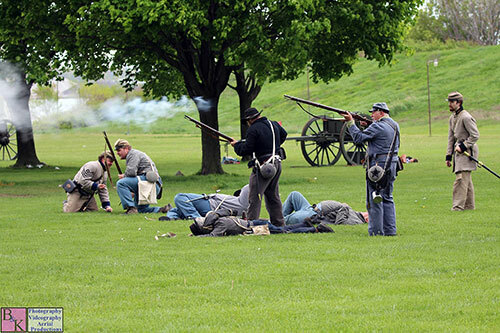 A Confederate skirmish line in the tactical demonstration. 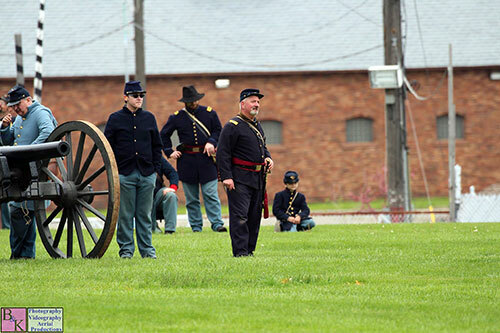 We were proud to host a Middle School experience during our Civil War Days. 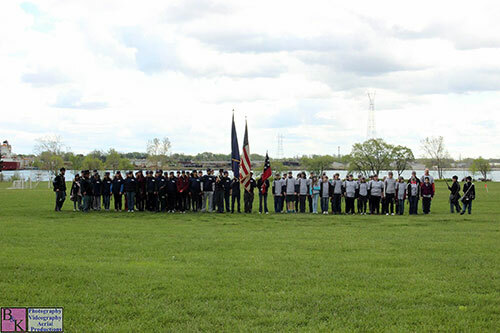 These kids spent a day learning how soldiers on both sides lived by doing it. Doesn't their line look great? How do you get a great line? Well, step one is you need a sergeant major! 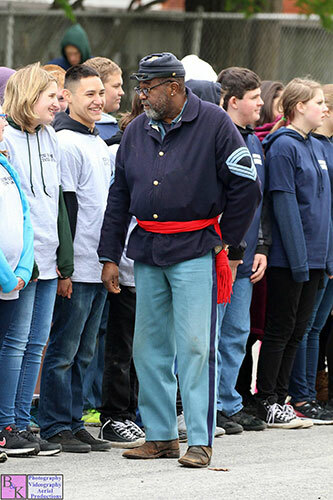 Here, a living historian from the 102nd USCT interacts with the students as part of their experience.